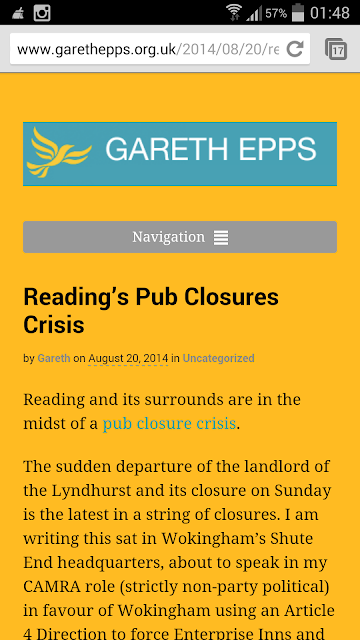 Reading and its surrounds are in the midst of a pub closure crisis. The sudden departure of the landlord of the Lyndhurst and its closure on Sunday is the latest in a string of closures. I am writing this sat in Wokingham’s Shute End headquarters, about to speak in my CAMRA role (strictly non-party political) in favour of Wokingham using an Article 4 Direction to force Enterprise Inns and Tesco to seek planning permission for their attempt to turn the Maiden Over in Earley – a successful pub in the Good Beer Guide – into yet another Tesco. There is no other pub within a kilometre, and the nearest has a temporary manager in situ and is rumoured to be bought up by another supermarket. Meanwhile the Horncastle on Bath Road has also shut. All three pubs are owned by Enterprise Inns – Britain’s biggest and most notorious pubco, much-criticised for shutting good pubs and treating landlords appallingly. The Eldon Arms has also shut, a Wadworth’s pub where the family brewer’s friendly image has quickly vanished after a dispute with licensees who had to close the kitchen down after getting rave reviews for their food. Another Wadworth’s pub, the Star at Waltham St Lawrence, is also reportedly about to close. Meanwhile objections are being submitted to the application to remove the last traditional skittle alley in the area, the formerly Punch Taverns-owned Red Lion at Theale – also in the Good Beer Guide until it was closed with no notice. This will be a test for a West Berkshire Council’s new and robust pro-pub planning policies. CAMRA has thankfully stepped up its pub protection campaigning under pressure from members; the new Pubs Matter campaign site from CAMRA is set up to pressure politicians to close the planning loopholes that allow the backdoor closure of pubs and change to supermarkets. Meanwhile the Fair Deal for your Local pubco reform campaign headed up by Greg Mulholland MP is gathering pace before a critical vote which will decide whether the Bill before Parliament has teeth. One thing is certain – people in and around Reading who care about community pubs have plenty of reason to get stuck into these campaigns. Having had to organise an emergency meeting three weeks ago about one pub closure only to be told of others, I would urge like-minded people to join me in this.